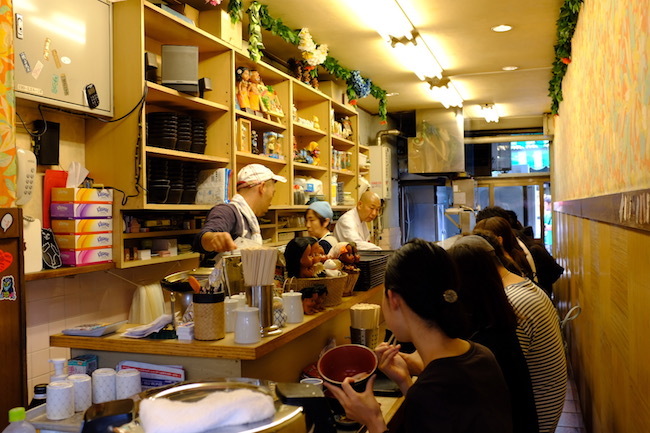 Space is limited in every aspect of life in Japan, including restaurants and their kitchens. I found myself pretty enchanted by the inventive use of space, and the freedom these cooks have to just make it work. And do we really believe that all of our rules keep us safer? I've seen no evidence of widespread food borne illness in Japan. The looser regulation results in a mind blowing amount of eateries, in Tokyo alone the number hovers around 80,000 restaurants (compared with 15,000 in New York). 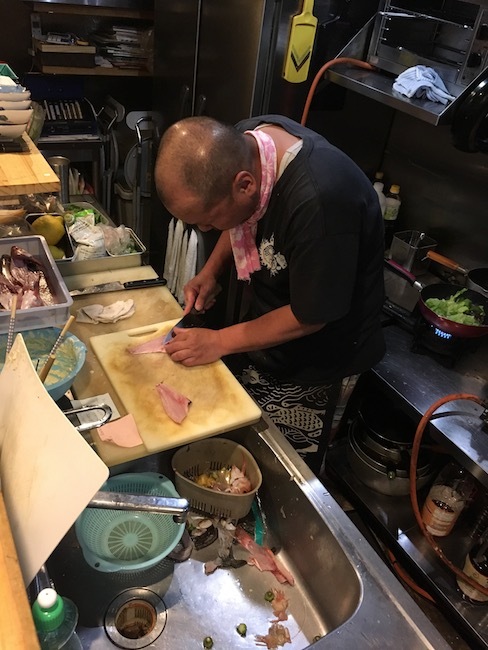 Many have no more than 12 seats, which goes a long way to explaining the specialization of Japanese restaurants, along with the consistency and quality of the food. A large portion are run solely by their owners, meaning the person with the most knowledge and the most care is the one who is actually making your food. The above scene, at Uluru Wine in Hiroshima, was my favorite tiny kitchen of the trip. On recommendation from our coffee man in Naoshima we found this great little wine bar and wandered in to grab two of the six seats at the bar. Turns out it was pop-up night, run by the coolest gal, an artist whose name I cannot recall but I have her on instagram as @masm_paintings. From the minuscule two burner stove behind the bar she grilled us fava bean pods, fried baby taro, and warmed a squid stew...it was delicious and intimate. She kept the all natural wine flowing, told us stories of her time making art in Berlin and made us feel like we belonged in this impossibly hip Japanese moment. She also pointed us to our next destination - a stand up izakaya where absolutely no one spoke English and everyone was having a great time. Without her recommendation we would never have had the balls to walk through the narrow doors of this place on a dark side street, deserted aside from the salarymen spilling out of the brightly lit bar onto the sidewalk. We pointed at what others around us where having by way of ordering, downed a few glasses of sake and let it all sink in...totally out of our comfort zone and still finding a way to get ourselves fed (and pretty buzzed too). Home now and plotting our next trip, my mind swirls with tiny kitchen dreams filled with extension cords, no ventilation, uneven flooring and meals made with some serious soul.